Just an Average Mormon: He Already Has! This post is by Melissa Degn Smith. What is the number one reason why I have “so many” children? Because I grew up in a large family? I did, and it rocked! But that's not the reason. Because playing hide-n-seek is my favorite thing ever? Actually I get my greatest secret-treat-snacking-without-having-to-share during those games, but I digress. Because I like to provide my neighbors, everyone at church, Walmart and the post office (least favorite place ever) with free entertainment? The answer is STILL no, however it's slowly moving up my list. Because what early 20s year old wouldn't LOVE to change diapers for others for 10 years straight? Need I even ANSWER that?!?! Hi, my name is Melissa. I have 7 children ages 10 years old to 10 months old and I'm 32 years old. I recently read the cover story of Time Magazine on “The Childfree Life: When having it all means not having children” and it got me thinking. I mean, you're RIGHT!!! You CAN travel more, own more “things” (unless you were going for bunk beds and I think I have most people beat! ), be “successful” in the business world and *gasp *, actually sleep in if you did not have any children. It's an article about those who CHOOSE to be childless and not those who simply can't have children for some reason or another. (big difference!) My decision to have the size of family I have has nothing to do with things of the world, convenience and of temporal comforts. It has everything to do with my Heavenly Father. I did not come to earth to fulfill my own purposes but to fulfill HIS purposes through me. *The Church of Jesus Christ of Latter-day Saints (“Mormon” church) has the stance that the decision to have and when to have children is 100% between husband, wife and God. Let me just make that clear. I was just asked to write on what personally motivates my husband and my decision. In writing about something so personal it by no way means that I am judging or counting children in others' families. I understand the number of variables that go into making a decision to have one child or ten children! Again, these are my personal thoughts. so we can ultimately return to live with Him. Is this mic on? Are you still there? What does this have to do with my 7 children?!?! I'll tell you. It's because I KNOW that there are spirit children up there waiting to get bodies and just waiting to become part of a family....... ideally a family that can teach them about Him and His love for us while we are away from Him. Kids aren't just created at conception/birth. Their bodies are, yes....... but their spirits have been learning, preparing and patiently waiting for their chance to get a body! (Have you ever wondered why your kids come with different personalities from day one? There's your answer) I am physically able to provide that body for them, so I choose to.... even if it gets trickier, less comfortable, inconvenient and harder for me to do so. His spirit children are already up there, it's just where and to whom they will be sent to that is the unknown to us. So moving on the purpose 2 and 3. I would learn how to forgive better from my sweet-hearted child who is quick to forgive and let me try again the next day. On that same note, I'm learning to forgive myself. I would understand more fully how to sacrifice. How to give up my temporary wants for the betterment of someone else....true love at its finest. I would learn priorities. I would understand what TRULY is important and which relationships matter most. I would learn to judge less. I can look around at other moms with a sense of empathy and understanding instead of a close-minded judgement towards someone trying their hardest. Because each child and situation is just so unique. I would learn disappointment in myself and how to cope with it, get up and try again. I would have my weaknesses so blatantly thrown at my face day-after-day becoming SO obvious and repeated that they must be tackled and worked on through the help of my Savior Jesus Christ. I would get a MICROSCOPIC feel of love that Heavenly Father must feel for me. When my heart feels like its going to burst w/ so much love and fulfillment, I can't help but think of multiplying that all of His children. The love a parent has for a child is pretty overwhelming. Who knew such a feeling existed?!?! I would learn that even on days I feel used, tired, un-appreciated and worthless that I can kneel and pray to immediately feel the love and support of a Father who entrusted me with a few of His children.....cheering me on with gratitude for my willingness to keep trying. I would learn that I could succeed and be happy at any random thing, but my greatest happiness comes from seeing those I love succeed. I would learn that the mundane tasks of keeping up a household and my attitude towards that will define my happiness for that day. I can CHOOSE how to feel and react about any situation even if I can't control the situation itself. Basically, I would understand my role in this master plan is NOT about me, me, me. When I look back on the short 10 years I've been a parent, I truly don't remember the hard days or the overwhelming sacrifice of it all.The things that stick out to me and make me smile are the memories we made, the warm hands I've held, the little bodies I've snuggled, the “You're beautiful, Mommy” comments when I make breakfast with no makeup and the bigger-then-life smiles I get when I show up to support their baseball games. The rewards from parenting FAR outweighs the constant effort put in. Whether the rewards come now or later (in a kind of law-of-the-harvest way), they are more precious then anything tangible here on earth. Period. I know if I live the most Christlike life I can and follow His teachings to become better, I will be able to live not only with Him again, but also with my WHOLE family.......... forever and always. I thank my Heavenly Father every day for that promise. Every. Day. So bring it on all the endless “You sure have YOUR hands full”, “are those all yours?”, “Are you done yet?”,“don't you know how that happens? !” comments here on earth!! I would say the trade off in the next life and the joy and fulfillment I feel here on earth is worth it. LOVE it. Love your perspective. LOVE YOU!! With tears in my eyes, I am grateful for your words of wit and wisdom. It makes me empowered to be MORE and not to take for granted the dear ones God as entrusted to me. Thank you for this wonderful post. Awesome Melissa! You've done it again. Sure do miss you and Brooks. melissa that was incredible. What a wonderful way to express yourself!! Its been great watching your family grow. I loved reading this!!! I have 4 little ones (5,3,2 and 7 months old)and we want at least 4 more! Children are such a blessing! You're such a good writer! Your post gave me a boost for the day! Melissa! So a random friend posted this on facebook and I decided to read it only to find out it is my old friend Melissa!!! I was reading along, thinking "this is beautifully written" then I got to your picture and seriously did a double take! Wow! Anyway, this was beautiful! Thanks! I need to check your blog more often, love hearing how you are doing! Take care friend! BYW, I have an Aunt (who is not a member) and her and her husband chose not to have kids and my mom told her so many times when were were little to have a couple of kids and she did not want the "inconvenience." One day we had a family party and she came, she saw my mom surrounded by her grandchildren and I saw the pain and regret in her eyes. I was sad for her. We try to include her and make her feel like another Grandma, but it is not the same. Children are such a blessing! Thanks for sharing this post and your beautiful words! I also had 7 kids 10 to newborn when I was 32. I love hearing the question "are you done yet"? This is a beautiful post! What a wonderful, and refreshing response to the Time Magazine article. I appreciate and love your views, thank you for posting! Coming from a family of 7, I am just cheering you on all the way girl! Because nothing makes me happier! Can't wait to start my own. My 3 other sisters, cute mamma, and sis in law talk about the joys of mommyhood often and this post so beautifully sums up all of our feelings. There just rings true to me, it represents someone who has been turning to the light! Just think you are phenomenal!! Thank you! Thank you for posting this. In a world full of people telling you that you are crazy, or have too many kids, or you have your hands full etc, THE BEST REASON why we have kids has been explained so well in this post. Children are blessings. Although it is hard work, your family will be eternally blessed. Keep up the good work and thank you for being a wonderful example of strength. 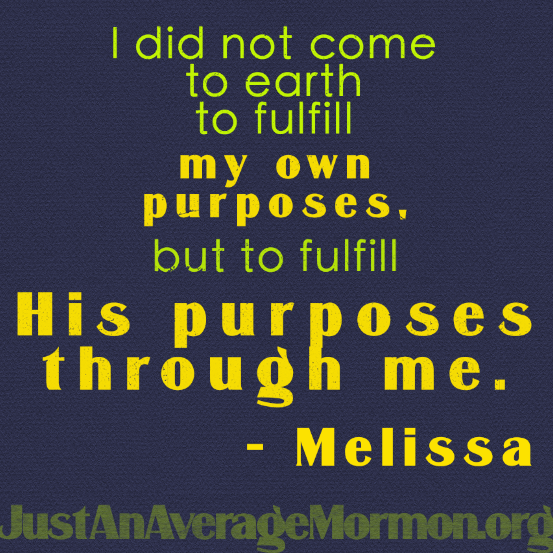 Melissa, What a testament to motherhood. As I read this I realized how blessed I was and how many of the blessing God has given me, I had forgotten about. Looking back I know that He was so much a part of my life in raising my children and I didn't let Him take control. Everyday I thank him for the family He has given my children and grandchildren. I have finally realized that the saying, "Let go and let God" is so true. We are truly blessed! Thanks Melissa. 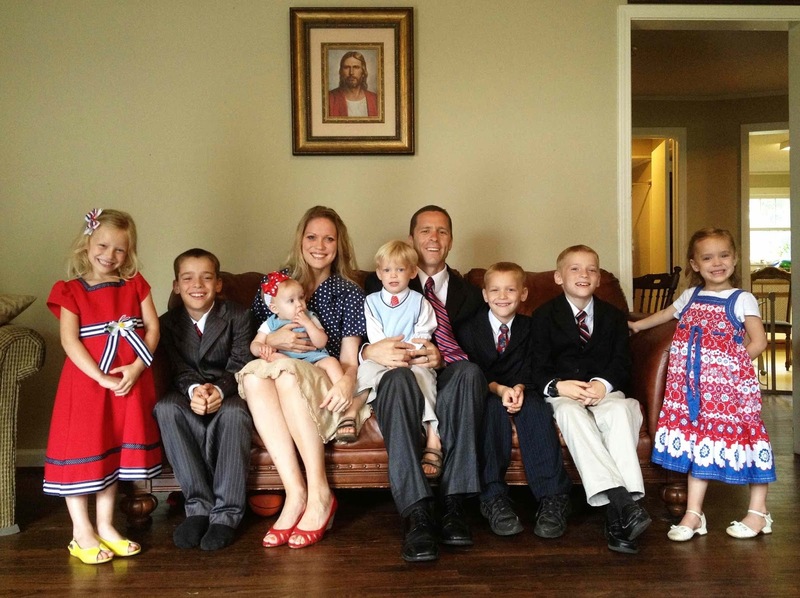 There are so many blessings that come with large families (e.g. built in best friends, less picky eaters, lots of love and laughter etc.) that really have to be experienced to be understood. 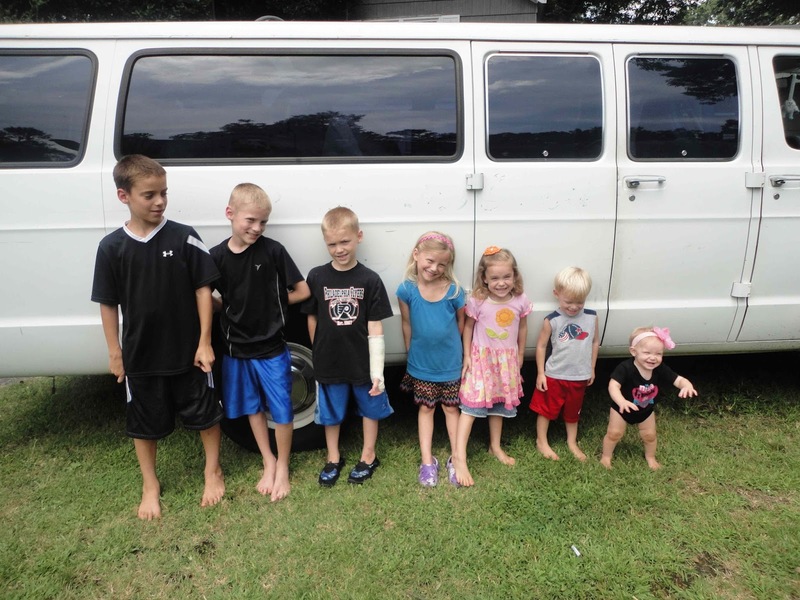 Raising our seven children was chaotic at times, but full of adventure and fulfillment--I find having many children enhances your sense of humor ;-). You haven't yet experienced the next phase, but with the coming of grandchildren (all the joy and fun--hardly any struggle and pain) you will find all your sacrifices bearing fruit in ways you couldn't anticipate. The "lonely years" aren't. Your life just gets richer and richer as your posterity "multiply and replenish the earth". I have colleagues and friends who chose to be childless. They have "wealth" and "freedom" but they can't retire because there is nothing to retire TO--they quickly become bored and unfulfilled. The beach houses and boats have become a hedonistic distraction, but they have found that their happiness is hollow because they have no one to share them with. At the core of choosing to be childless is a fundamental misunderstanding of the purpose of life. We are here to give not to get. We are here to lose our lives in service to others not to "save our lives" for our own self-fulfillment. The great irony, as Jesus taught in Luke 17:33, is that when we focus on our needs first we become shallow and selfish whereas when we live for others (children etc.) we find happiness and fulfillment. I'm proud of and grateful for your choices to make a happy home for your precious children. The decision is quite counter-cultural, but is right at the core of happiness and prosperity (http://www.popapajoe.com/2013/04/how-we-found-health-happiness-prosperity.html). "Don't you know how that happens?" "Yes, That's why I'm SO successful at it!"